Hi, everybody. Nesse episódio do podcast Inglês Online eu falo sobre algo que ouvi numa sitcom hoje que me fez morrer de rir. Hi, how’s it going? Today we have a new episode of the inglesonline podcast. To download or just listen to other episodes and download transcripts, go to inglesonline.com.br and click Podcast Inglesonline. So today I was watching an episode of an old sitcom when the lead character just said something that cracked me up. First things first: what does “cracked me up” mean? That means that what that character said made me laugh very hard. I was watching the sitcom, and all of a sudden I was laughing out loud, all because of that one line the character said. “It cracked me up” is a very common thing to say. You know that person, that friend you got… and whenever you’re around him or her you always end up laughing your head off? So that friend is someone who cracks you up. Listen again: he or she cracks you up. Why? Because your friend is really funny, and whenever you’re around them, they crack you up. Some jokes crack me up every time I hear them. Seriously, some things are so funny that no matter how many times you watch them, or hear them, you still laugh your head off. Chandler, a character from Friends, cracks me up. I’ve watched every Friends episode multiple times, but it doesn’t matter… Chandler cracks me up every time. OK, on to the sitcom I was watching. 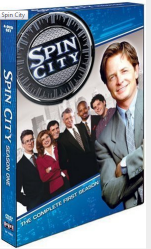 It was an episode of Spin City, which started airing in 1996 and went on for six seasons. This is what the character said that cracked me up: “I’m not the club kinda guy. If I wanna shout in someone’s ear I’ll go visit my grandma”. So if you got what he said, great. If you didn’t get what he said, let’s break it down. First thing he said was “I’m not the club kinda guy”. “Club” here means “nightclub”, a place where you go with your friends at night and there’s a lot of very loud music, and lots of people dancing… So when he says “I’m not the club kinda guy”, what he means is, he’s not into nightclubs. He doesn’t enjoy nightclubs. If someone tells you “I’m not the salad kinda guy”, what does it mean? It means this guy doesn’t like salad. Someone else might say “I’m not the book kinda guy”, which means he’s not into books. So “club”, “salad” and “book” become something like an adjective in these sentences. “I’m not the club kinda guy” means “I’m not the kind of guy that enjoys or goes to clubs”. Alright, so after the character says he’s not into clubs, he says “If I wanna shout in someone’s ear I’ll go visit my grandma”. Ok, so anyone who has ever been to a nightclub can relate, right? You don’t really talk to other people when you’re in a nightclub, you have to shout and then that person will shout back to you. Actually carrying a conversation in a nightclub can be really annoying, so… if you enjoy going to clubs I’ll bet you’ve got some reason other than talking. Maybe you enjoy dancing, flirting, but you certainly wouldn’t go to a nightclub to have a long conversation with someone. So there you have it – when the character said that, I could relate. I knew immediately what he was talking about, and that is why it cracked me up. By the way – that’s what “I can relate” means. I know exactly what you’re talking about, I get it, I’ve been there, I’ve had the same experience and I understand what you’re saying. I can relate. That’s how I felt when I heard him say that – I could relate. So I thought it was funny when he said that if he wanted to shout in someone’s ears, he would go visit his grandma. Why did he say that? Because his grandma is old and she probably can’t hear very well, so he has to shout to her, rather than talk to her. So what are your examples? Who cracks you up? Can you relate to what this character said? Let us know in the comments and talk to you next time. I just can’t download the mp3, what should I do? PS. : I love this site, it helps me so much that you wouldn’t believe it. And something that crackes me up are the books of Rick Riordan, his way of writing makes everything look funny. I’ve never heard of Rick Riordan! Thanks for the tip..I’ll have to look him up. it crackes me up, not only because what they say but because they’re funny. A friend called Andre always craps me up. It seems that he always have a new joke at the tip of his tongue. Every time I talk to him I laugh my head off. Deep thinking – adds a new dimisneon to it all. Thanks so much for providing individuals with a very special chance to read articles and blog posts from here. It really is very brilliant and as well , stuffed with amusement for me and my office peers to visit the blog more than thrice every week to read through the new stuff you will have. Not to mention, I’m at all times motivated considering the striking pointers you serve. Certain 1 points in this article are in fact the most efficient we’ve ever had. Friends ever crack me up, especially Joe. He is really funny! Thanks a lot for teach us! Michael Kyle character from My wife and kids crack me up. Every day when I watch the series I laugh my head off! My daughter is 02 years old and cracks me up every time. She is a funny girl. Hello Ana, such a great topic. You made back to mind into jokes of some friends from Fortaleza city, they always crack me up. I have keeping you in every update and it is very funny. To learn with thats podcasts up to us. Yeah, I, too, have friends who never fail to crack me up… amazing! Agora, deixar de receber seus e-mais ( 4 )? Nem pensar! You’re incredible, Ana! Thanks for this class. I wasn’t the sitcom kinda a guy in the past, because I didn’t get what characters said. But now, since I started to study with you, I love it. So maybe who cracks me up is Damon Wayans or any episode of “everybody hates Chriss”. Sure! past, present, future, anything goes. So the person that cracks you up now is this Damon guy. Yes, dear! Do you know him? Damon is the father in “my wife and kids”, it’s a litle old, but I like.